Hyenas have hind legs shorter than their front legs, this popular Zulu African Folktale explains what happened to Hyenas legs. Wolf and Hyena were together when a white cloud floated by high in the sky. Wolf jumped up, landed upon it, and ate of the cloud as if it were fresh meat. When wolf had his fill of the white cloud, he said to Hyena, "My cousin, I am ready to come down, if you catch me I will bring you a piece of the cloud for you to taste!" So Hyena caught him, and broke his fall. The cloud wolf gave her was so delicious she wanted more; she jumped up on top of a white cloud and ate until she was full. She told wolf, “Catch me and I’ll bring a piece of cloud for us to eat later as a snack my wolf cousin, now catch me as well." The scoundrel wolf said to hyena, "My cousin trust me, I will catch you, jump down now!" Wolf held up his hands, and hyena jumped down from the cloud, and when she was near, Wolf started jumping around yelling, "My cousin, do not be mad at me. Ouch! Help! A thorn has pricked my foot and is hurting me!" As a result, hyena fell down from the white cloud above, and landed with her two back legs on the ground. 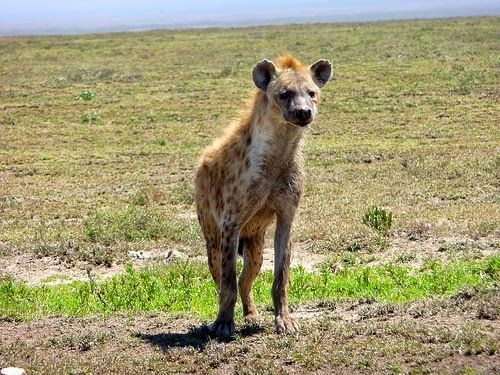 Since that day, Hyenas have hind legs are shorter than their front legs.